In 1965, Mr. Edwards heard a performance by a local group of musicians in his home town, Wilkes-Barre Pennsylvania, a group whose reputation exceeded its abilities. After later hearing another performance of similar questionable quality by another local group, he vowed to make a change: to raise the standards of music in Northeastern Pennsylvania, including music broadcast on local classical music radio. 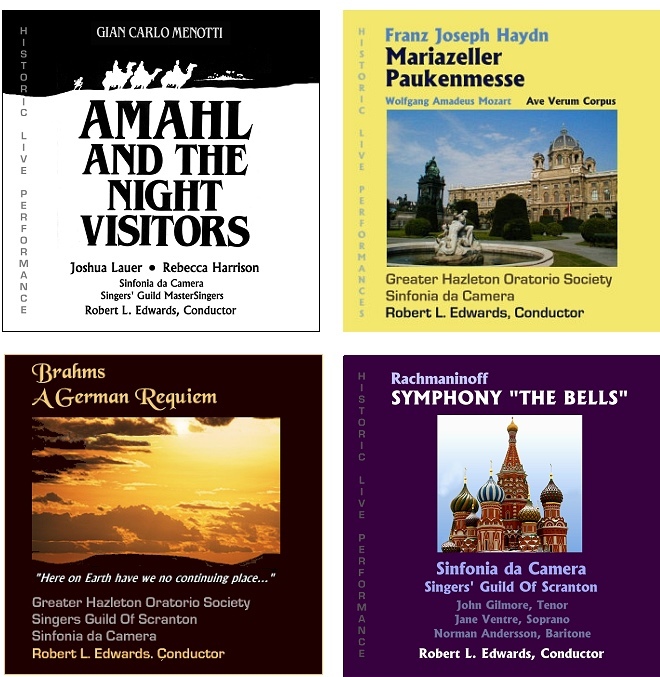 After earning his Masters Degree in Conducting, Mr. Edwards returned to the area, established the Northeastern Pennsylvania Philharmonic Chorus, and subsequently accepted positions as Music Director and Conductor of The Greater Hazleton Oratorio Society, The Singers’ Guild of Scranton and the chamber orchestra Sinfonia da Camera. With these groups, he set out to realize his dream. 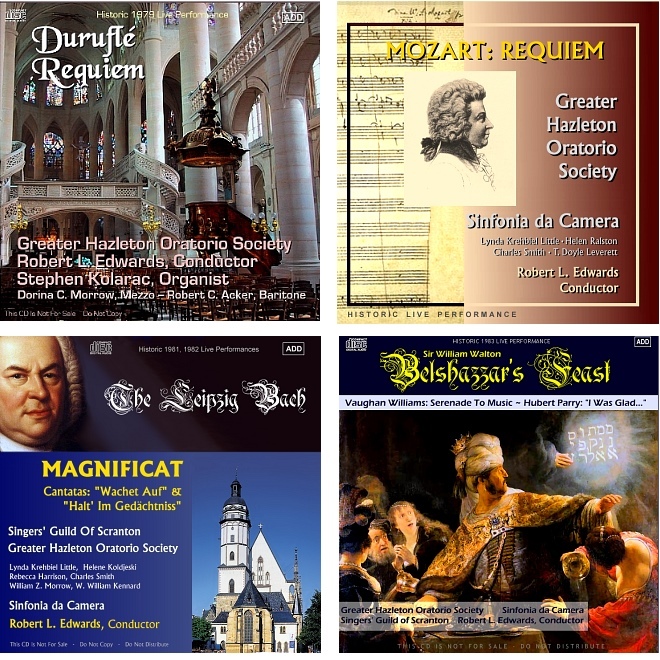 The artistic achievements of these groups during the last decade of the 20th century have been preserved in a limited set of CDs stored in regional libraries and in the homes of principal members of these organizations. 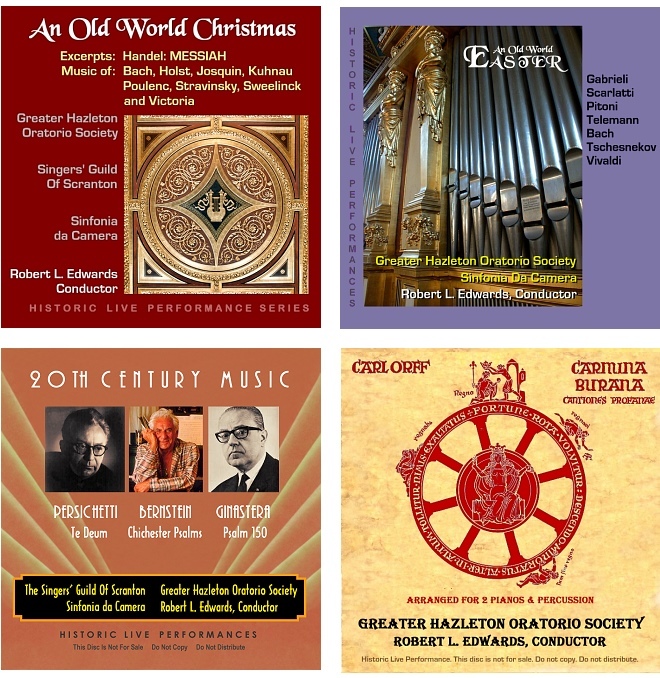 It is hoped that these recordings of live performances will bear testament both to the learning process and to the goals that were achieved by these semi-professional and professional community-based ensembles: Greater Hazleton Oratorio Society, Singers’ Guild of Scranton, and Sinfonia da Camera. Mr. Edwards writes: “All the performances by the ensembles I conducted were recorded live for later broadcast, and I kept old-fashioned cassette copies of those master tapes, although I rarely, if ever, listened to them. “After the tragedy of 911, with my ”Computer Consultant” office around the corner from the World Trade Center, the emotions of that event led me back to those tapes, which had been stored in a cardboard box in a closet. I listened. “The 15-25 yr.-old tapes were in bad condition, the signal level had faded, the frequency response had shifted and the tapes were very hissy and filled with dropout. “What stands out for me, is the growth in understanding performance technique and musical style achieved by these wonderful folks. The live performances were not flawless but represent such a high-level of achievement they deserve preservation and recognition. Contents and WebDesign © Copyright 2009 by NYConsultants . All Rights Reserved.